in my last post, I wrote about how often it's possible to make delicious meals with ingredients you already have in your pantry! this recipe is no exception. 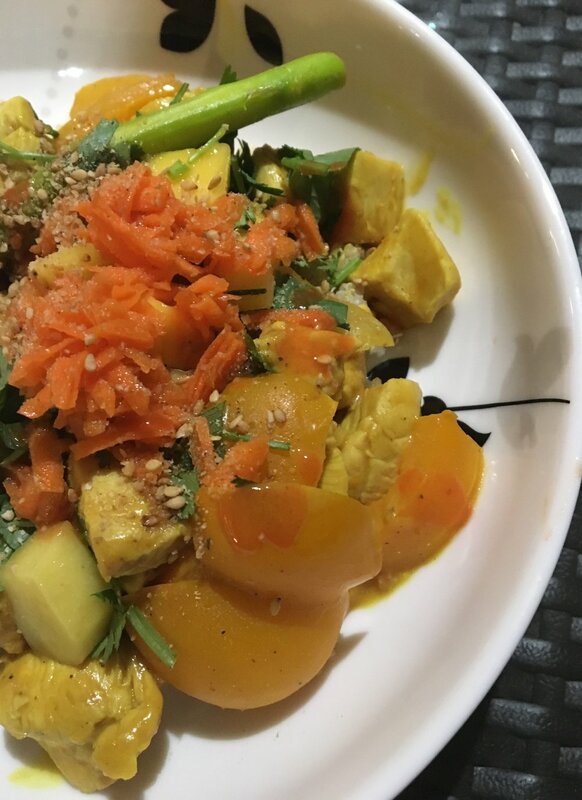 recently, while vacationing on the Big Island of Hawaii, I threw together this stirfry with what we had in our fridge and pantry, and it's since become a household favourite! personally, I think the quick-pickled carrots is what really takes it up a notch. plus, you can easily make it vegan and grain free (options below). remember, the best part about stir-fry is once you have your sauce, you can use whatever you have on hand - it's a great way to clear out leftovers! and, because there's lots of chopping involved, I love cooking this with my husband. 1. chop, shred or julienne your carrots and cover in rice vinegar. cover and set aside. 3. prepare and chop all veggies, slice chicken or tofu into bite-sized pieces. 4. in a large fry pan, heat coconut oil on med-high heat, adding garlic once oil it hot. add in onions, stir until they're sweating and then add fresh ginger and turmeric, salt and pepper. 5. add your sliced chicken or tofu, continue to cook until browned (the chicken will take longer than the tofu). You can start to prepare your quinoa or rice noodles (or grain-free option) at this point, too. 6. once chicken is browned add in your vegetables, starting with peppers and then the broccolini. I prefer for my vegetables to be a bit crunchy, so just cook them as long as you'd like, making sure your chicken is cooked all the way through. 7. turn heat to low and let it cool for a few minutes before adding your sauce. 8. serve over quinoa or rice noodles and garnish with fresh cilantro, pickled carrots, mango, sesame seeds, and hot sauce if you'd like!